Circuit based workouts are nothing new in gyms. In fact they’ve been around since at least the 50s. Their ability to enhance cardiovascular fitness and muscle endurance is exactly why they still form the basis of countless fitness programmes around the world every day. One person who saw the business potential in this type of group training is Peter Oakden. He has been running his circuit training business ‘CaveFit Edinburgh’ for the past two years, seeing great growth and success. The venture has been so successful that he is looking to expand his facility in 2017, with the goal to offer more intense sessions for even larger groups. Read how Pete established his business model, keeps his sessions fresh and discusses his favourite exercises in this interview. We spoke to Peter for a long time, and covered many more topics than you can read below. If you would like to hear the full interview, listen to the full recording on our SoundCloud. 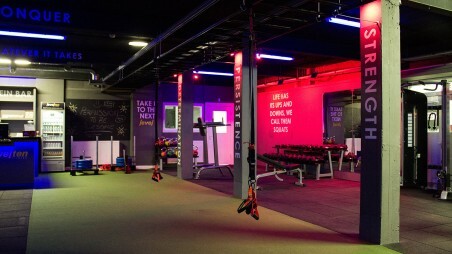 To what extent do circuit based classes play a role in CaveFit’s business model? The original concept was to have a 30-minute functional class but I decided to add a bit of a twist on things. I wanted to make it a little bit more extreme and raw by adding weights, lifts and chucking stuff about, so it’s not just the standard circuit exercises. I was aware that putting all these extreme exercises in to the Cave could possibly alienate certain people. When we first set up it was important for us to have a difficulty scale ranging from the most advanced lifts all the way down to your simple bodyweight exercises. The sessions are completely adaptable ranging from complete beginners to elite athletes. How did you go about naming your sessions? We don’t give individual workouts specific names. I really like the Steve Jobs model with his concept for the Apple products. He based it around five core products. iPod, iMac, iPhone etc. After reading this, I said to myself “my goal is to have five products which are all based around strength or conditioning”. It’s taken us two years to evolve this goal but we are there now. 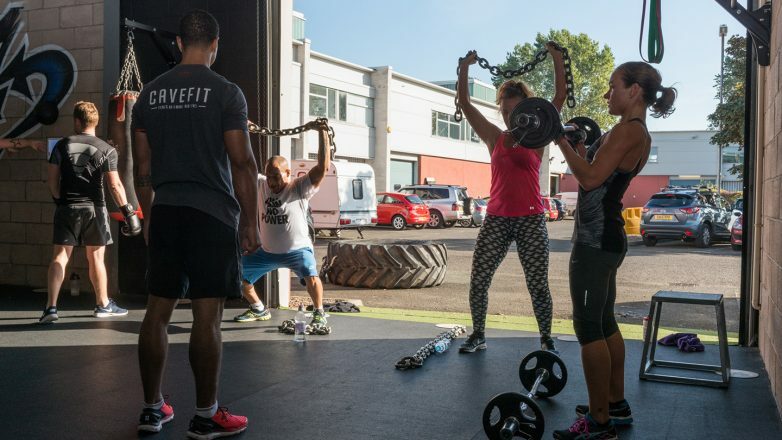 CaveFit and CaveHIIT are our high intensity classes. CaveLifting is purely based around the squat, deadlift and the bench press. This is set to a different tempo and accommodates up to 12 people per session. CaveConditioning is our pure conditioning class and also accomodates up to 9 people per session. CaveKids is tailored specifically for kids aged 12-16 years. We generally maintain that a combination of 2-3 lifting sessions combined with 1-2 HIIT sessions a week is ideal. With our setup, you can get your full week's workout in the Cave. Simplicity and consistency are the two words that I work from. Do you also provide on-to-one support? The only one-to-one you’ll get in the cave is through Personal Training. We have four CaveFit PT’s available on hand for this purpose as our sessions are all group based. What is the pricing structure for CaveFit? Originally, it was pay and go only. The option of buying blocks of up to 12 sessions with a validity window we felt kept individuals motivated to train. I didn’t want to be in competition with any of the commercial gyms in my area like Pure Gym or David Lloyd. I wanted people to decide to do their training at the Village, but come do their conditioning at the Cave, so to say. A single Single CaveLift is £8.50. CaveFit, CaveConditioning and CaveKids are all £7.50. CaveHIIT is our cheapest option at £6.50 per class. Obviously, buying them in blocks will save you money. We will be reviewing these at the end of the year to keep it in line with the service we offer our customers. 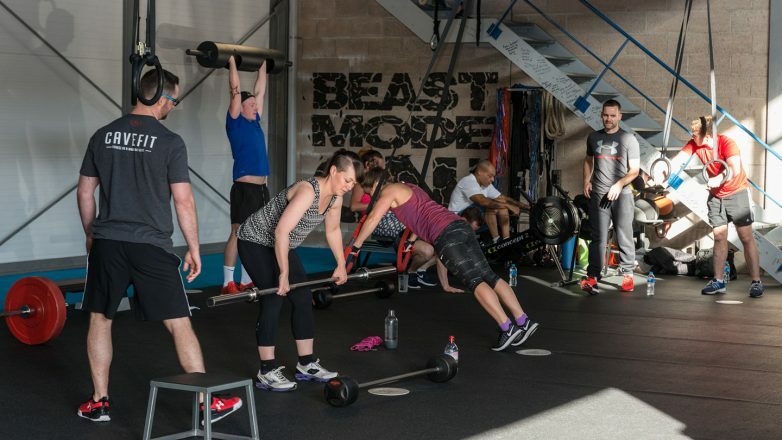 As our business grew we soon realised there were people were leaving fitness establishments to train with us and wanted to “join us” – so there was demand for memberships. I decided to create that membership – which wasn’t something I advertised and marketed to a huge degree. I just wanted it to have a core element of people who love the Cave as much as I do, and let them be members. That’s what’s just been created. There are 35 core members, which is not a lot but these guys are on it. They always have their CaveFit t-shirts on and are always there early. In my view, important people. They are the members who are dragging others in and I rely on their feedback for everything. Is there a formula you apply to your sessions, and how do you develop them over time to keep variety? We are on our 106th circuit at the minute – that variety is something we work hard on and I feel makes us better than anyone else. We try to programme our CaveFitters the way an athlete would be programmed. This means that each week we focus on a different area (power, speed, strength, agility, etc.) and add these fundamentals in to the circuits. Every Thursday I reset the whole circuit. That’s something that keeps us challenged. 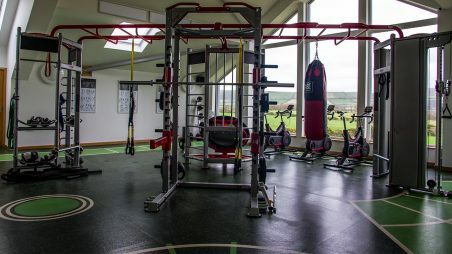 Thinking of new varied circuit options that motivates our members to keep coming back! Can you give us an example of a CaveFit session? You always start with a 10-minute dynamic warm-up of your own choice. This can include skipping ropes, TRX, rower, powerbands, or anything similar. Once everyone is warmed up, two coaches come through and lead you in to the Cave. One of us will demo the exercise and the other explains what you’ll be working/achieving whilst doing that exercise. In my CaveFit class I will have 35 to 40 exercises laid out and each exercise will be explained before the session starts. Once we’ve gone through explanations of all the exercises, everyone decides where they are going to start. We then work our way around all the stations, on a one minute on, 15 seconds off interval system, so it gets pretty intense. Once everyone has completed each exercise, you'll have achieved the recommended daily 45 minutes of exercise. All participants are then given a foam roller for some self-myofascial release and a stretch cooldown. This can be done for as long as you need to while you relax and have a bit of banter with the rest of the group. Do you have a favourite session and exercise? If I’m not coaching in the morning, the CaveFit at 6.30am is my first choice. If I know I can't make that session, CaveHIIT at 6pm is my other favourite as both are high intensity classes. 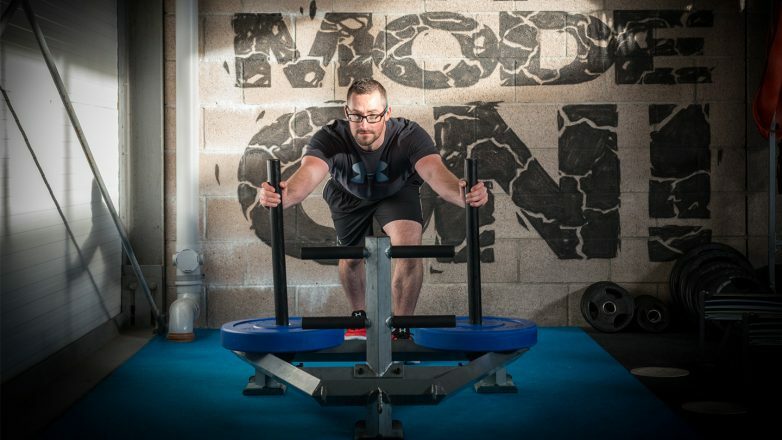 My favourite exercise is the prowler - it simply hammers you. 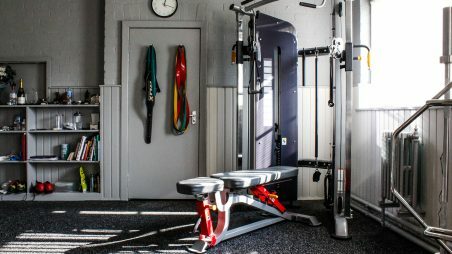 If you are doing a circuit and already completed 34 stations and it is waiting for you at station 35 , you know you will be challenged physically and mentally. Do you track individual member progress? 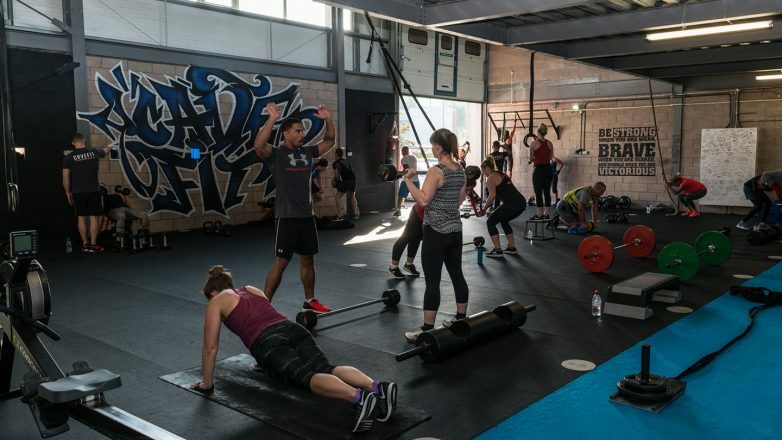 We have things in place to support CaveFit and HIIT members but it is quite difficult to track due to the style of training we provide and the volume of people that come through. It is easier to track a member’s progress in the CaveLift classes. Rob our lifting trainer is amazing at numerically tracking every single member. He adapts the training to push them forward. You are literally getting programmed as if you’re going to a PT or as if you’re an athlete. We have some ideas to support the CaveFit and HIIT members on a more individual basis but we haven’t implemented them yet as we continue to research all options through member feedback. We do not want to rush in to anything without thinking about the effects in the long term. Do you take your sessions outside in the summer? We even take it outside in the winter! We have the luxury of a car park at the Cave where we can take the battle ropes, tyre, sledgehammers and sprints outside. The track round the car park takes 30-40 seconds, so it's a great sprint station! It allows us to get creative with the equipment and the space. We’re considering getting the space turfed by one of our members to allow up to ten stations outside in the summer! How do you market yourselves at CaveFit? T-shirts and clothing are perfect. Participants pay for the t-shirt and its free advertisement for us when they wear it. In the beginning, I just wanted to train clients and really had not thought about merchandise. I rely on one of my clients who is very good at giving me a realistic view of how I'm doing. He suggested investing in merchandise as well as improving our reception area so that it was more welcoming and the products were visible to purchase. This took me a while to get right. As for social media, all our coaches have an Instagram page with the same profile under the CaveFit brand, this provides a consistent look to our brand but allows the coaches to post their own content and ideas. All our online platforms are linked and kept up to date. I believe it is important to keep everything current and looking great. What lessons have you learned since starting the business that you’d want to share with someone considering a similar circuit training business model? I learned quickly to take time employing the right people for our business model. My biggest thought early on was “I’ve got a business and I can be the head honcho.I will get this guy to do this and that” I soon learned that being the leader was far more constructive and showed others what my work ethic was – be the first one in and last one out, every day. For 12 months, I worked every day on my own. This was lonely and tough but allowed me to familiarise myself with how the whole business worked. From being the cleaner and personal trainer right through to operations and membership management. From a class planning point of view – always make safety the number one priority. There have been a couple exercises we’ve implemented but have never re-visited due to a couple of incidents with some clients. We’ve only had two incidents in two years - a good statistic. We never get anyone saying, “I’ve pulled this or tweaked that in the session” and believe this is due to the due care we offer our participants before during and after a session. Participants know they will be coming into an intense session and that it involves throwing heavy things about. We do the right things. We induct people, we coach them, we screen them. I have turned people away from CaveFit because their body was not in the right place to train to that level of intensity and directed them towards Cave Conditioning or PT instead. We spoke to Peter for a long time, and covered many more topics. If you would like to hear the full interview, listen to the full recording on our SoundCloud. This entry was posted in Knowledge & Advice, Gym Owners Advice on 11th May, 2017 by Eva Deckers.